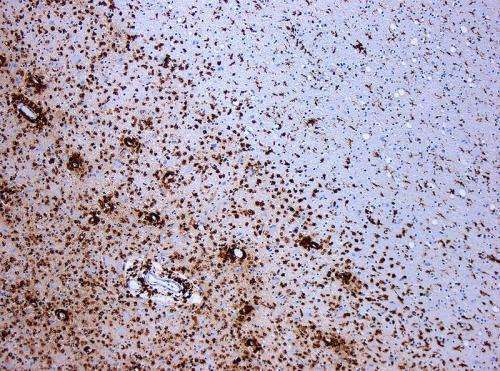 New step toward determining the cause of MS. Researchers at the University of Toronto have found another clue in understanding the cause of what drives Multiple Sclerosis (MS) disease. Their findings were published today in Immunity. MS is a disorder in which the immune system attacks the brain. It has no known cause and no cure. Normally, immune responses are triggered in lymph nodes and other lymphoid organs to protect us from a virus or pathogen. However, scientists have observed that a type of white blood cell known as lymphocytes can sometimes congregate into so-called "tertiary lymphoid tissues (TLTs)" in the brain of MS patients. These structures are similar to lymph nodes, but are found within the outer membrane of the brain - known as the meninges. They often coincide with the appearance of tell-tale brain inflammation associated with progressive MS. But how the TLTs are formed and what keeps them there has been unclear. The U of T researchers, led by Professor Jen Gommerman of the Department of Immunology, discovered that TLTs were created by the presence of stromal cells, which are specialized cells that produce an intricate network of fibres. They can effectively create a net, which once formed, become a gathering place for a type of T cell known as T helper 17 cell (or Th17). "While T cells are an important part of the body's ability to ward off infection and disease, in autoimmune disorders, they can mistake healthy tissue for potential threats and respond by lashing out, causing damage. The team observed that this Th17 response resulted in the type of brain tissue inflammation associated with MS," says Gommerman. More than that, the Th17 cells could also influence how the stromal cells organized. The resulting structure that developed was remarkably similar to normal lymphatic tissue, such as you might find in your tonsils or lymph nodes in your neck. Gommerman says this research, which was conducted using animal modeling, doesn't deliver a definitive answer to what causes MS, but it does appear to be a "smoking gun" associated with MS pathology. With further research, it may point to potential treatment options, such as targeted Th17 blockers.